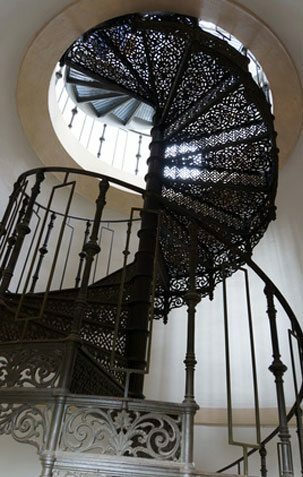 The spiral staircase shad its hour of glory, at first for the service of the domestics in the “small apartments” of castles Louis XV, then with the arrangement of libraries, bars, and shopping galeries in the XIXth century. 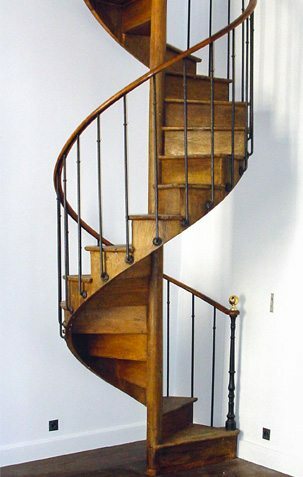 If English used from the beginning of the XIXth cast iron spiral staircases for them winter gardens, the wooden spiral staircase remained, till the end of the XIXth century, a very French speciality, only few models of which can be find in the other European countries. He establishes a beautiful example of the quality of our crafts, which puts the virtuosity of the technique of the wood in the service of a lifestyle. It is completely in solid oak, with its English-style silt and its wallnut handrail, maintained by iron balusters. He allows a minimum loss of place, the smallest models are 105 cm diameter. 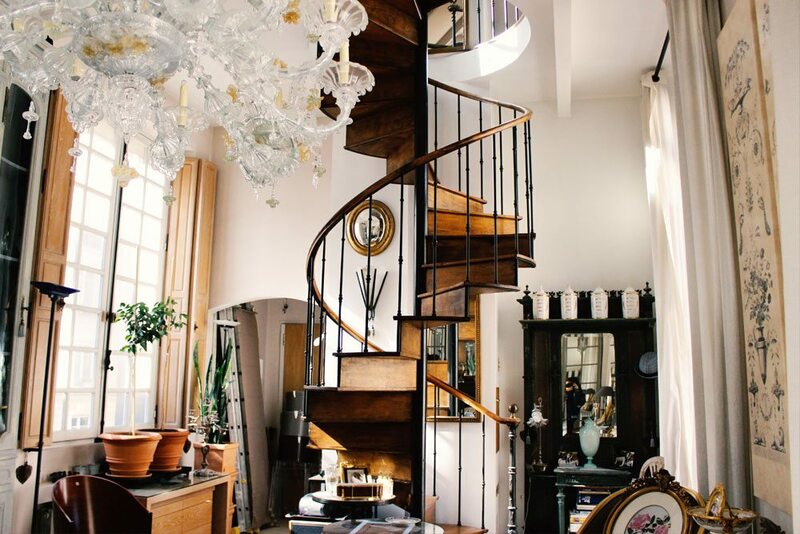 Today, these staircases which are often more than 150 years old, are reused in duplex apartment and in artist studios where they bring an indisputable charm. They cannot be installed in places of difficult access, because they are built all in one piece, and are not knockdown. 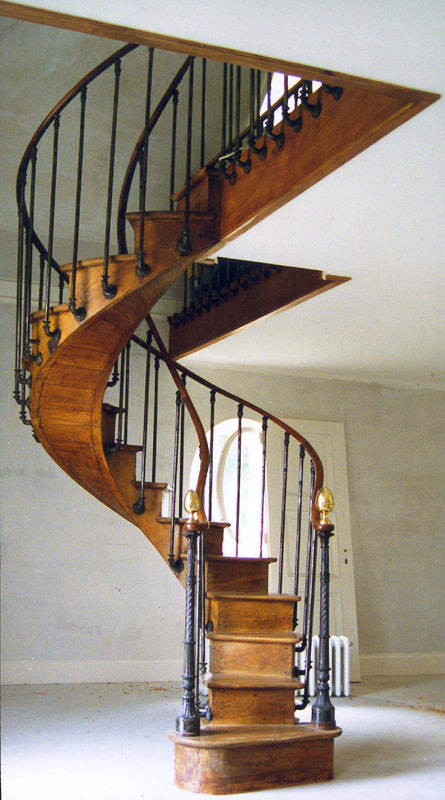 At the end of the XIXth century in the region of Lyon, a craftsman of Italian origin Gilardi had applied for a patent for his ingenious principle of construction which assures a staunch solidity even for staircases of large diameters (160 centimeters for example). 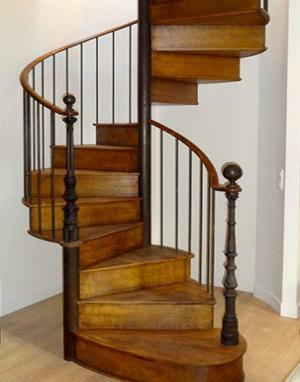 Steps and risers are in oak, the newel post is in iron, as well as balusters with decoration of rings which support most of the time a walnut handrail. 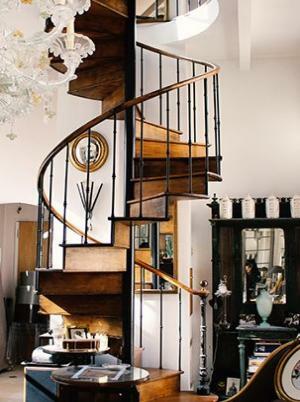 This type of staircase grants with all the decorations. Its weight is reduced and its very bare structure opens widely to the passage of the light. Its ease of assembly and knockdown allows to install it even in places difficult to access. 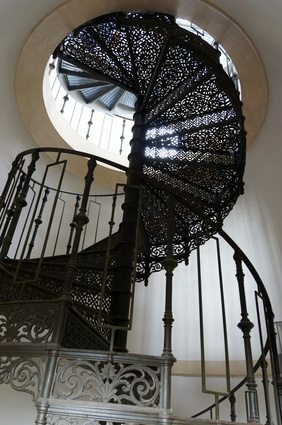 Usualy spiral staircases turn either towards the right or towards the left, but in certain cases the first steps leave in a direction then turn the other way. This to adapt itself to the constraint of the place and not find itself with the landing step in front of a wall for example. These staircases have no central post. Steps are carried by two parallel silt and are lined from both directions by a handrail. This are magnificent rare works of the XVIIIth and XIXth century. Built carefully in oak, their diameter is rarely lower than 160 cms. Their installation requires big care and their top has to be the object of an extremely solid hanging. Furthermore, they are made in one piece, and ask for a wide accessibility up to the place of the installation. Often from Napoleon III period, they are very ornamented and were intended for winter gardens. 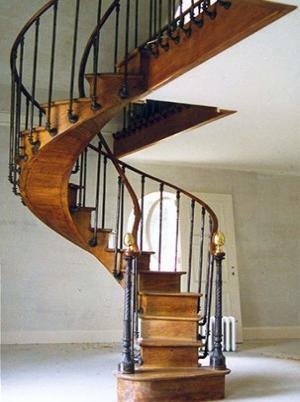 English were the specialists of this type of staircase. They are very ornamental, a bit noisy, and before any project of installation, it is necessary to take into account their important weight (up to 800 kilos).